Today I give you another post concerning gardening and cooking, as that is pretty much what my life has been comprised of recently. I haven't really done any creative work beyond trying out some new things in the homemaking arena. We have entered the big push to the end of the school year. We have one child in marching band camp, Boy Scouts, and swim team, another on swim team, and a third still wrapping up speech therapy for the year. Add to that all the end of year testing, celebrations, and ceremonies, as well as play dates and visitors and holidays, and I barely have a moment to call my own. Two more weeks of school and then we will have only swimming and band camp and travel to occupy us. Besides the children's schedules, I have my own things to do. We are having a terrible time with rodents in the garden. Moles are tunneling through the vegetables and chipmunks or rabbits or something dug up my new lily bulbs and ate them. I am very sad, because although this new yard came with many nice plants, my favorites: Stargazer lilies and gardenias, are not among them. I was hoping for some lilies in a few months. These bulbs must be very sweet, because I have a lot of trouble keeping animals out of them. When I plant them in the back the dogs dig them up and eat them and when in the front deer or squirrels or something else eats them. Last week I made a hot pepper sauce and poured it in all the mole tunnels and around the bulbs and it worked for a little while, but now it's worn off I guess. 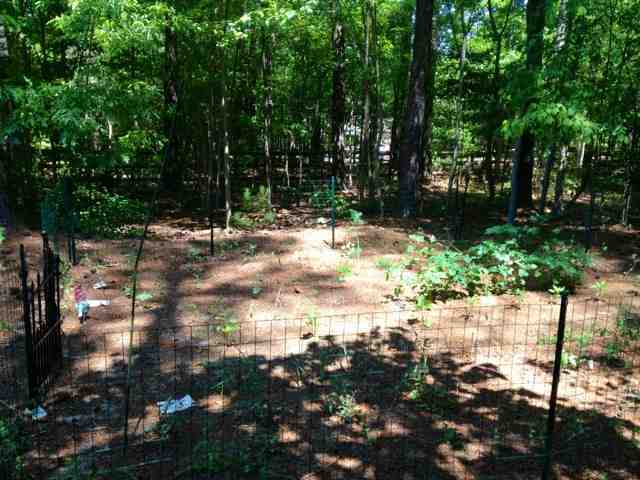 I would very much like to find a nice, large black snake to relocate into our yard! One row of the garden isn't doing well. Everything looks sickly in that spot, so I mixed up a fertilizer of banana and avocado peels mixed with coffee grounds two weeks ago and today applied another of compost mixed with powdered milk and Epsom salts. I also made a simple syrup spray with sugar and water and applied that to the tomatoes, peppers, squash, and peas we have in blossom to attract more fertilizing bees. We do have some tiny peas and tomatoes on the plants. I used our Amazon points to buy a new dual compost tumbler, "The Ultimate Soil Machine", and I happily anticipate the wonderful compost we will have in a few weeks. 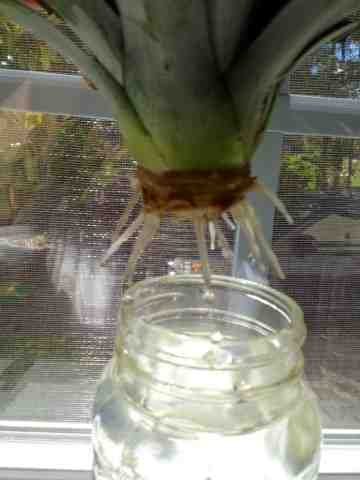 A pineapple top beginning to root. Aldi has such great prices on pineapple we are eating it nearly as much as if we lived in the tropics. 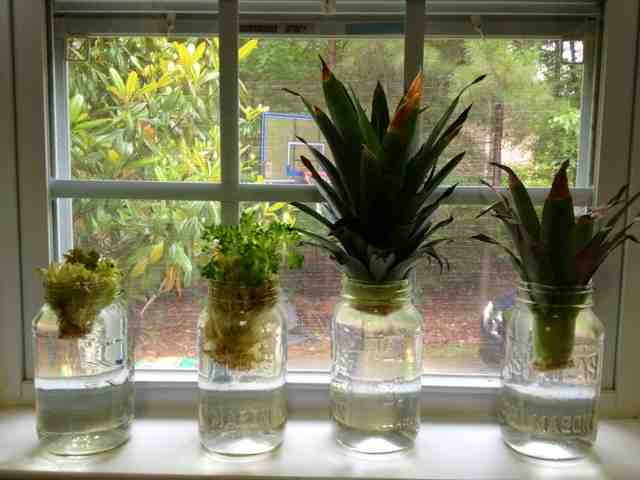 I saw a Pinterest tutorial on rooting the plants and I tried it. I have one top putting out roots and another trying to do so. I took this photo about a week ago; now the roots are long enough on the larger pineapple to plant! The roots after about a week. I am really looking forward to it. We spent a week in the Dominican Republic a few years ago and toured a family farm which grew cinnamon, pineapple, cocoa, coffee, and vanilla. The lady of the house offered us samples of her fresh produce and the pineapples were so delicious. We bought some of all the spices for ourselves and our friends. I hope my pineapples will produce as well as my lemon and lime trees have if I set them outside for summer and bring them in for the winter. I also tried growing the lettuce heads from scrap. These don't root; what you do is put the base in water and change the water each day. The center will send up new growth. 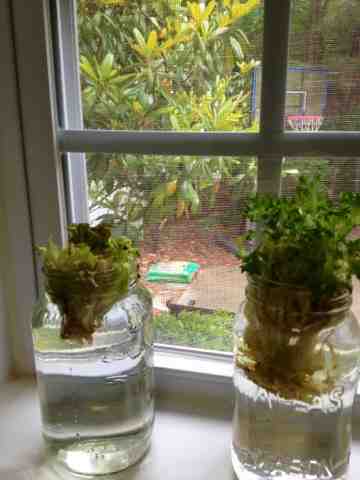 The small growth is about two days' worth, and the larger is about a week old. At this point you must harvest the larger head by cutting off the new growth or it will all rot and die. 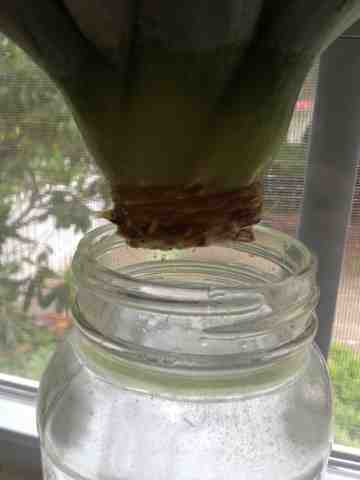 I don't know that the small amount of new growth you get is worth having the jars sitting all over the place. Over the holiday weekend we went swimming and discovered all the beach towels are missing. Heaven only knows where they are! We also finished painting the bonus room and setting up our new wall unit, so I will have photos for you soon. I was able to purchase an elliptical machine from a neighbor for a really good price ($75! ), so I've been doing that along with swimming to try to keep from hurting my foot any more. The elliptical allows me to go fast and get my heart rate up like I'm running, but it doesn't put the strain on my foot that running does. I couldn't believe how out of shape I got over the winter when I went swimming. 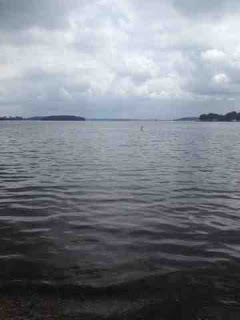 I only swam for about 40 minutes and I really felt it the next day! It's frustrating, after swimming every day last summer, to have to start all over again. I wish I had a pool to use in winter! We also had to buy another new set of clothes for our teenager, who has outgrown everything again. He last outgrew all his clothes around February! I unpacked the other two kids' summer clothes from last year, so I feel like I'm drowning in outgrown clothes! The weather here was true to form and our yard sale was rained out after only a little while, so I'm selling much of that stuff as well. Watch my store, as I am selling these as fast as I can get them listed: http://stores.ebay.com/atelier-mandaline. Since yesterday was a holiday I made a special treat for dinner: what I call my "Two Worlds" dumplings. I meant to take a picture of these after they were cooked for the blog, but they were gobbled up so fast I didn't get a chance. They look pretty much like any won ton or potsticker dumpling, though. The reason I call them "Two Worlds" is because of a funny coincidence, which requires a rather long backstory. If you ever happen to find yourself in Zhengzhou, China (in Henan Province), do yourself a favor and go eat at the Holiday Inn Express hotel noodle shop on the first floor next to the lobby. You can watch the chef prepare handmade pulled noodles right when you order them. I highly recommend the delectable hand-pulled noodles with duck. Then make sure to order the green onion and pork dumplings, which are absolutely divine. I think they are called "Spring Dumplings" or maybe "Chive Dumplings" on the menu. As often happens when memory is obscured by the mist of time, these have become blurred in our minds, but we do know they were fabulous. I thought they were "water", or boiled dumplings, but Jerry is sure they were potstickers. I have tried many recipes to recreate them and I sometimes boil them in broth and other times cook them as potstickers. In trying to recreate the Holiday Inn dumplings, I tried many recipes from my Chinese cookbooks, tweaking this or that, but I never could find just the right one. I, as many of you know, am half Scandinavian, Norwegian mostly. It happened a couple years ago that my parents' neighbor brought them an enormous bag of green onions from his farm in spring. This was such a large haul that, even though they gave me and two of my sisters bags of onions, it seemed like more than any of us could eat. I thought of making Kroppkakor: Swedish dumplings which are eaten with lingonberry jam for breakfast or with beer as an afternoon snack. As I read over the recipe, though, it occurred to me how much the filling of these dumplings resembled the Chinese dumplings we had in Zhengzhou. Kroppkakor are dumplings made with a potato dough, rather like gnocchi, and stuffed with an onion, ham, and bacon mixture. Normally you would use regular yellow onions, but since I had all the green onions I planned to use those. I found, though, that by switching the ham to sausage and the yellow onions to green and using won ton wrappers rather than potato dough I had a very fair approximation of the Zhengzhou dumplings. Over time I've revised the recipe a bit more. I now add a splash of soy sauce (I actually use the healthier Bragg's Liquid Aminos, which Jerry calls my "hippie" soy sauce). Sometimes I boil these in broth for won ton soup. Other times I cook them as potstickers, but no matter how I cook them and no matter how many I make there are never any leftovers! Although we can certainly stuff ourselves with one whole batch at a time, I usually freeze half before boiling or steaming. These take so much time to make, so it's really nice to just take them out of the freezer and whip them up. I hope to one day travel to Zhengzhou and taste the Spring Dumplings again, but in the mean time these are a good substitute! Cook bacon over medium heat about 2-4 minutes. Add onions, soy sauce, and allspice, and cook about 2 minutes or until onion begins to soften. Add sausage and mix in well. Cook another 2-4 minutes until sausage is cooked. Set aside to cool. When filling has cooled, prepare each dumpling by placing a half tablespoon of filling on one side of the wrapper. Wet your finger and run it along the outer edge of the wrapper. Fold the wrapper into a triangle, and fold edge over again about 1/8 inch to seal the seam. Repeat until the filling is used up. This will take 1 and a half to two packages of wrappers. 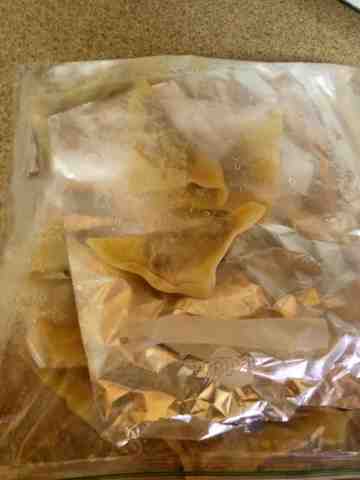 Boil dumplings in broth for soup until the wrapper is clear. For potstickers, melt 1-2 TBSP coconut oil in skillet on medium-high heat. When the oil is hot enough to sizzle when you splash a bit of water on it, add the dumplings and cook until the underside begins to brown. Add 1/2 cup water to skillet, and lower temperature to medium-low. Cover and steam dumplings until the wrappers are somewhat transparent, about 5 minutes. Serve with soy sauce, or soy sauce mixed with wasabi for dipping, or serve with broth and add dumplings to broth as desired for soup. You may freeze the dumplings prior to cooking; to cook them from frozen do not thaw and add 3-5 minutes to the steaming or boiling time. Here you see the frozen dumplings. Layer foil or wax paper between them to keep them from sticking together. When I make these I always serve broth with them. I use my 6-hour bone broth (chicken) but I add raw shrimp with shells on and more green onions to it and cook them in the broth. I strain out the shrimp and remove their shells and then add the shrimp back in. If I have Nori on hand I add strips of that as well. I season the broth with Chinese 5 Spice powder, Mirin or Sake, Soy Sauce, and salt and pepper. We were lucky enough to have a lovely weekend. Although moving has been stressful, I feel very blessed to have found such a beautiful place to call home. We are really enjoying the parks and lake here in Denver. The children hunt for honeysuckle by the lake. Labels: Dumpling recipe, how to root pineapple plants, Potstickers, rooting kitchen scraps. I've been working hard since my last post, but mainly on the house and yard. For those of you who have not been following this blog, in November we were relocated by my husband's employer and purchased a house. 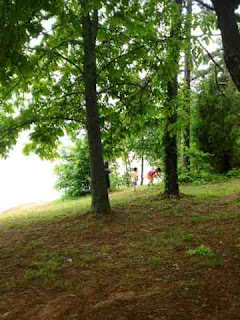 We soon found out from the neighbors this house sat empty for years, a fact not disclosed to us by the sellers. We've done a ton of work indoors and out, but have a great deal more waiting for us. 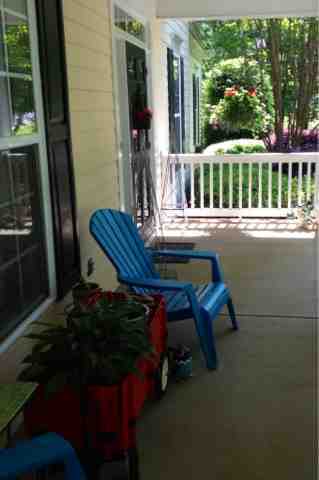 This week I decided to tackle the front porch. 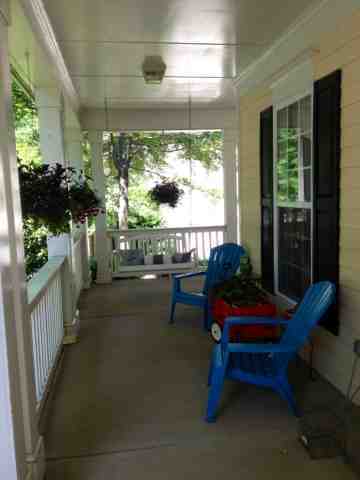 One of my favorite things about this house is the old-fashioned farmhouse porch. It's really wide and wraps around one side of the house. The weather is finally nice enough to sit outside, and the kids can play on the porch in our frequent rains. Even with furniture it's wide enough for them to skate or ride bikes and stuff. I had a good friend in Ohio who lived in a house with this type of porch and we would roller skate and play "Mother May I?" and all sorts of games even in rainstorms. I've always wanted a house with a porch like hers! The porch came with the swing, and it's a nice one. I've had the wagon out as a focal point since we moved in. I found it out by the curb with the trash years ago. One of my hobbies is walking or driving around on trash day to pick through people's discarded junk. Unfortunately there's no trash service here so you have to hang around at the dump to indulge this pastime, and a bunch of old men already have that covered! Anyway, as a present for our 15th anniversary, Jerry restored it. I told him it's too nice now for the yard. I think it's sturdy enough the kids could play in it again. But I've really enjoyed decorating it for the seasons. At Christmas I set up a little Leland Cypress in it and decorated it as a Christmas tree. For Easter it held an egg tree. Now, I've moved my houseplants out to summer on the porch. 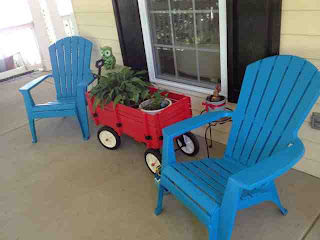 I really want to get some rocking chairs, but since it's not in the budget just yet I brought these turquoise Adirondack chairs up from the backyard. Turquoise and red is a favorite color combination of mine, and I think it really pops against the yellow. The silver plant supports and bird house were planned for the house we were building in Raleigh, which had gray and blue siding, but they still look nice with the yellow. My mom bought the hanging baskets for me as a birthday present. Eventually I mean to make it back to Mary Jo's for some outdoor fabric so I can re-cover the pillows on the swing. They are just bed pillows in regular fabric so right now I have to bring them in when it rains. I also want to replace the yucky old lights and fan. I'd like to find some New Orleans style lanterns. We will be visiting NOLA in the fall so maybe I can get some then. Since we are in Carolina I also plan to paint the ceiling "haint" blue, said to keep both bugs and bad spirits away! I am considering staining the floor Charleston green or possibly painting it to look like patterned tile. 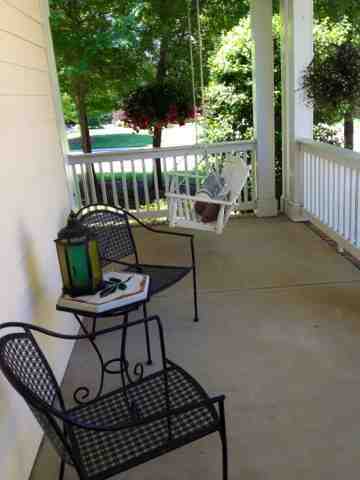 Over on this side of the porch I want to set up a little dining area. I have an old end table in the attic which I think is tall enough to eat from but small enough to take up little space. I plan to paint it, probably turquoise, and make a cloth for the top and then it can be used with these iron chairs. Somewhere around here I have more lanterns with citronella candles and when I find them I will make a hanging display with those. A few months back, you might remember we planted daffodil bulbs in the front yard natural area and I was worried they wouldn't come up because we got them on clearance and I thought we planted them too late. We had such a cold spring, though, they had time to grow and they are still blooming, which is pretty much unheard of in May. Usually these are done by the beginning of March around here! 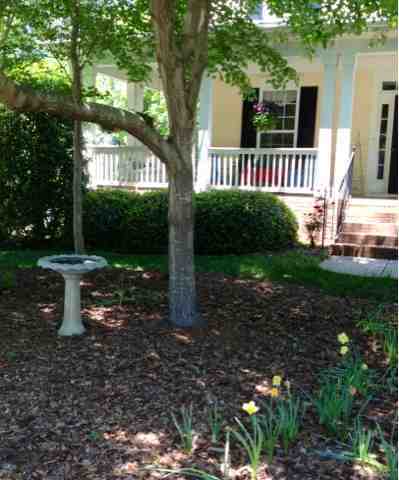 We set up the birdbath and I think it looks really nice under the trees with the flowers. I've also planted some lily-of-the-valley under the trees, and I'm thinking of putting in grape hyacinth as well so next years we will have the blue and yellow together. I think it looks like a park! The vegetable garden is doing well still. My parents visited and my step-dad helped cut down a tree that blocked the light so now the vegetables can really thrive. 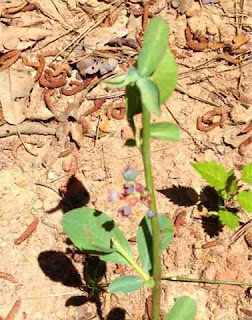 We have some blueberries already on our brand-new bushes. I just planted raspberries and blackberries as well, but they haven't even leafed out yet. 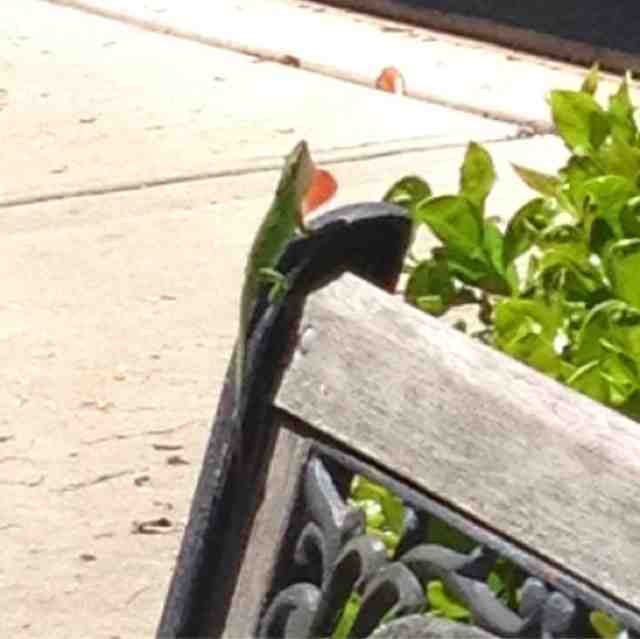 My four-year-old and I spotted this lizard. I thought of the Song of Solomon, "the voice of the turtle is heard in the land." I've never heard a turtle's voice and this lizard's call isn't audible to me either. We have lizards all over the place, so I wonder at all the insect problems we have. I guess when the house was empty they just really got a good hold. The exterminators have been back each week because it turns out the ants were infesting the siding. Whenever we stop them one place they just start coming in another. I spent a good part of the day yesterday mixing up homemade fertilizers and insecticides. Yesterday I fixed Cuban pulled pork in mojo sauce for supper. the sauce is made with Cuban sour oranges, but since I didn't have any of those I subbed in lemons, limes, and mangoes. I made a spray to kill aphids on the roses out of the peels from the fruits. You chop these up in a food processor and mix them with water and baby shampoo and strain out the solids to use the liquid as a spray. Ants are also repelled by citrus, as well, so I put the solids I strained out all around the foundation of the house. We will see if it helps. I hope so, because I really don't like having people spraying poison all over every week. I've been awakened twice in the night by an ant crawling on my face, though, so I am willing to suspend my organic principles and get rid of them! We are getting a few blueberries on our new bushes. I spent all of Wednesday working in the yard, hauling branches, trimming, fertilizing, and planting and then I walked at night, so I ended up doing more than 10 miles over the course of the day. Then on Thursday I spent the day carrying books and putting them on shelves. Besides the garden we have been re-doing our bonus room with the new Ikea wall unit. I will post pictures of that room when I finish it. I felt pretty good Thursday and had another really active day. But today I'm feeling it, especially in my injured foot. I will try to take it easy today, although I don't know how. We are having a huge neighborhood yard sale. Upwards of 600 people attend. I will be offering the contents of my eBay store as well as furniture and stuff, so if you've been watching something in my store you might want to go ahead and buy it before 7 tonight! The link is: http://stores.ebay.com/atelier-mandaline. Plastic epoxy used to form a high wall inside the leg cavity. I've done very little doll work this week. I had a really disappointing few days last week, and I guess I've just been over it for now. My "Senorita" Dollikin-face fashion doll was sold and delivered to Florida, but someone, either the mailman or the customer, left her in a 150 degree car and her face paint melted off. Then, one of the Betsy dolls had to come back to my "hospital" because her leg fell off a few days after she got home. This is not the leg I fixed; it is the other leg that was fine when she was here. The hip button isn't broken, and I was able to pop the leg right back in, but I want to try to figure out a way to secure the leg so it won't come off again. So, she's just been sitting around all week waiting for me to come up with a plan. I finally decided to build up the wall inside the cavity so the leg has more to hold it on. It was tricky to get a wall in there without restricting the movement of the leg, but I think this should do it. Incidentally, if your doll's leg comes off but there's nothing wrong with the hip button you can maneuver it back in by pressing the hip button against the inner walker mechanism and moving the button back and forth to push it into the leg hole. Also last week, I had two people who bid on eBay items not want to pay for them so I had to cancel those transactions. Most of the stuff I have sold has been my modern stuff. I barely break even on most of those toys. I buy them as store filler so I have something to sell when I'm working on dolls that take a while. Add to that the weather... after several beautiful days, it's now been raining since Saturday. The meteorologist keeps saying it will be sunny. My head says otherwise, though, and I've been right. I've had a headache like a spike through my temple for the past three days and that almost always means rain or storms coming. On Sunday I made a special dinner for Jerry's birthday and I got soaked running out to pick up some ingredients. I cooked pretty much all day! I roasted two ducks and made a chestnut mousse to go with them. 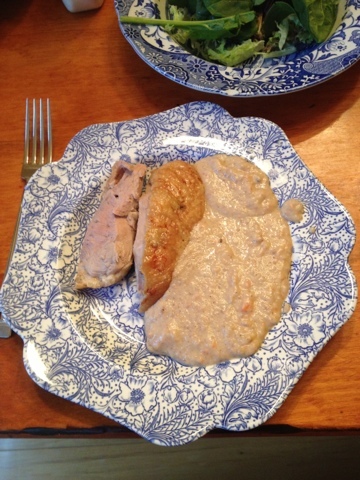 This is an Italian recipe: anatra arrosto con salsa di castagne. I use the chestnut mousse, or sauce, recipe from Carla Capalbo's Everyday Italian cookbook and use my own duck recipe. At home I could buy fresh duck and chestnuts in season from the Chinese grocery, but here I had to go with frozen duck from Aldi and preserved chestnuts I picked up at Kroger before we moved. This is an autumn recipe, so I usually make it in fall, but Sunday was so cold and rainy it seemed more like October than April and it's one of Jerry's favorites. I keep trying to talk him into hunting duck with our oldest so I can get really fresh, wild duck, but he's not into it. For dessert I made Kahlua cheesecake. 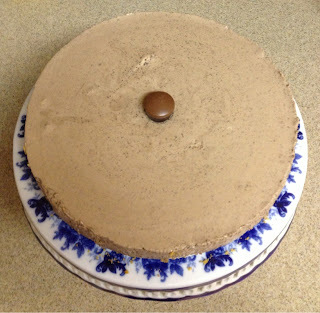 I adapted my recipe from an old recipe I had for Irish Cream cheesecake. The egg whites and gelatin make a very light-tasting cheesecake, more like a mousse than the very dense restaurant cheesecake you might expect. This cake does call for raw egg whites, so you may wish to use pasteurized eggs. I find this cake takes a long time to make, especially if you have an 8-year-old and 4-year-old "helping" you. I would allow at least one hour to prepare the cake and then at least three hours for chilling. Soften gelatin in water; stir over low heat until dissolved. Beat egg yolks, blend into gelatin with 3/4 cup sugar and the Kahlua. Cook, stirring constantly, over low heat 3 minutes. Combine cream cheese and cocoa, mixing on medium speed with an electric mixer fitted with a wire whisk attachment until blended. Gradually add gelatin mixture, mixing until well-blended. Chill until thickened but not set. Meanwhile, beat egg whites until foamy; gradually add remaining sugar, beating until stiff peaks form. Fold egg whites and whipped cream into cream cheese mixture. Pour over crust. Chill until firm. Garnish with chocolate truffles, such as coffee-flavored truffles. On Monday I made the mistake of getting on Facebook to send a birthday wish to a friend and got some horrible news. First of all, a little girl who was adopted and rushed to the States to have heart surgery died before she could even be operated on. Then, I saw the founders of the adoption agency we use were visiting a little girl adopted through their program who has since contracted brain cancer. She looks so much like my daughter it could be her lying in the hospital bed. I haven't been able to sleep without nightmares all week. I've had such a feeling of foreboding I read my own tea leaves the other day, but my forecast was good. I'm not great at reading tea leaves, but I hope I was right this time. My grandfather's cousin was famous for her skill with the tea leaves, but it seems to have skipped me. I've often considered closing my Facebook account because it seems like it's just an endless litany of tragedy or people posting misspelled, grammatically-butchered e-cards ranting against wrongs against them by some nameless person. In the past I rarely got on Facebook, but now that we've moved I've been missing my friends so I get on a lot. I should give it up because it seems like, except for my sisters, the people I really miss never post anything much anyway. But I know if I stop posting pictures of the kids my mother will be calling me, so I guess I'll keep it up. If you're on my Facebook, though, please post something nice I might actually want to read! I get so sad in this cloudy weather. The other day on Pinterest I saw a quote attributed to Neil Patrick Harris that said, "When I get sad I stop being sad and I be awesome instead. True story." I had to pin it as inspiration. When I get sad I eat entire tins of herring in mustard sauce and drink too much wine, as I did the other night. Or I run until I hurt my foot and can't run for a month, which is what I did in March. I'm starting to think I'll have to go to the doctor. I'm not thrilled. Our oldest just finished more than a year of visits to various doctors for his toe. Just one check-up at the podiatrist is $77 a pop! I don't want to start another account! I have been self-treating the sadness with Mumford and Sons. I downloaded Babel as an early birthday present and I've been playing Below My Feet over and over. Though it's a sad song, it surely must be one of the most perfect pieces of music ever composed, so it makes me happy to hear it. Yesterday was an interesting day. We finally admitted defeat with the ant problem and called the exterminator (although I am still using a natural remedy by planting mint around the foundation of the house; ants hate mint). He turns out to be a fellow eBay member. He restores dirt bikes and buys and sells the parts on eBay. I found this out as he was looking around at the dismembered doll bodies all over my office and asked, "What do you DO?" It's a small world! We were pretty sure the light above the tub in our bathroom was full of ants, so the exterminator took it down. Well, as he did so the light fell and broke and thousands of dead ladybugs flew everywhere. I'm pretty sure I'm going to be traumatized for a while now. I don't really mind live insects but I absolutely abhor dead bugs. I have horrible nightmares about them. I will dream, for instance, that I'm walking through piles of autumn leaves but them when I look close I find rotting insect bodies instead. I equate them with decay. I also have nightmares about spiders, even though they don't bother me when I'm awake. The strange thing is, I seem to have inherited those dreams. I only have them when I'm sick. I dream that spiders are marching across my body and I see their shadows stretched out across the wall and then I wake up sick. The first time I told my mom about that she couldn't believe it, because my father evidently also had bad dreams about spiders. Since he died when I was three, I never knew that about him. It seems both he and his brother had those dreams. When our oldest son was little he had pneumonia with such a high fever he was hallucinating and he thought spider webs were falling on him. My mom has a theory that somewhere deep in our ancestral past we must have lived in a cave or some place with poisonous spiders so potent we've buried the awareness into our subconscious for generations! The garden, as you can see, is doing quite well. I can't believe how it's grown since my last photo of it on the Cissy Sophisticate post. That was just a couple weeks ago. I am making fried rice tonight with the leftover duck and I already have onions big enough to pick and add to the recipe! I guess this constant rain does some good. I still have lilies to plant, along with raspberries and blackberries. Then I'm thinking of starting some late-crop tomatoes from seed to take over when the peas finish. I've been putting Epsom salts out to boost the magnesium in the soil and help the tomatoes and peppers set their fruit and to keep away slugs. I also put out the ashes from the smoker after Jerry smoked that fish for me. I figure both ash and fish juice must be a fabulous fertilizer! The gnomes are still working to scare away the squirrel, but not that robin!